Carl Edward Sagan (November 9, 1934 – December 20, 1996) was an American astronomer and astrochemist and a highly successful popularizer of several natural sciences. He pioneered exobiology and promoted the Search for Extra-Terrestrial Intelligence (SETI). Sagan is famous for writing popular science books and co-writing and presenting the award-winning 1980 television series Cosmos: A Personal Voyage, which has been seen in over 60 countries is the most widely watched Public Broadcasting Service program in history. Sagan also wrote a bestselling book supporting the Cosmos series and co-wrote the novel Contact, the basis for the 1997 Robert Zemeckis film of the same name starring Jodie Foster. During his lifetime, Sagan published more than 600 scientific papers and popular articles and was author, co-author, or editor of more than 20 books. In his works, he frequently advocated skeptical inquiry and humanism, and took political stands in opposition to global warming, nuclear weapons, and the Strategic Defense Initiative. His many awards include the Oersted Medal, the NASA Distinguished Public Service Medal, the Pulitzer Prize for General Non-Fiction, and the United States National Academy of Sciences Public Welfare Medal. Sagan was born in Brooklyn, New York, to a Jewish family. His father, Sam Sagan, was a garment worker; his mother, Rachel Molly Gruber, was a housewife. Sagan graduated from Rahway High School in New Jersey in 1951. He attended the University of Chicago, where he received a A.B. with general and special honors (1954), a S.B. (1955), and a S.M. (1956) in physics, before earning a Ph.D. degree (1960) in astronomy and astrophysics. During his time as an undergraduate, Sagan worked in the laboratory of the geneticist H. J. Muller. From 1960 to 1962, he was a Miller Fellow at the University of California Berkeley. From 1962 to 1968, he worked at the Smithsonian Astrophysical Observatory in Cambridge, Massachusetts. Sagan lectured annually at Harvard University until 1968, when he moved to Cornell University. He became a full professor at Cornell in 1971, where he directed the Laboratory for Planetary Studies. From 1972 to 1981, he was associate director of the Center for Radio Physics and Space Research at Cornell. Sagan was a leader in the U.S. space program since its inception. From the 1950s onward, he worked as an adviser to NASA. One of his duties during his tenure at the space agency was to brief the Apollo astronauts before their flights to the Moon. Sagan also arranged experiments on many of the robotic spacecraft missions that explored the solar system. He conceived the idea of adding a "universal message" on spacecraft destined to leave the solar system that could be understood by any extraterrestrial intelligence that might find it. At Cornell, Sagan taught a course on critical thinking until his death, in 1996, from a rare bone-marrow disease. Sagan was central to the discovery of the high surface temperatures of the planet Venus. His own view was that the planet was dry and very hot, as opposed to the balmy paradise some had imagined. As a visiting scientist to NASA's Jet Propulsion Laboratory, he contributed to the first Mariner missions to Venus, working on the design and management of the project. Mariner 2 confirmed his views on the conditions of Venus in 1962. 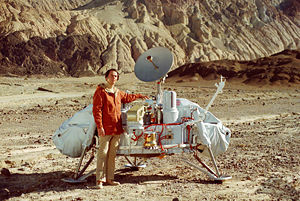 Sagan with a model of the Viking lander in Death Valley, California. Sagan was also among the first to hypothesize that Saturn's moon Titan and Jupiter's moon Europa may possess oceans or lakes, possibly under their surfaces, which are potentially habitable by life. Europa's subsurface ocean was later indirectly confirmed by the spacecraft Galileo. Sagan also helped solve the mystery of the reddish haze seen on Titan, showing that it is composed of complex carbon-based molecules constantly raining down to its surface. Sagan also furthered insights regarding the atmospheres of Venus and Jupiter as well as seasonal changes on Mars. He established that the atmosphere of Venus is extremely hot and dense with crushing pressures. Sagan also perceived global warming as a growing, man-made danger and likened it to the natural development of Venus into a hot, life-hostile planet through greenhouse gases. He also studied the observed color variations on Mars’ surface, concluding that they were not seasonal or vegetation changes as most believed, but shifts in surface dust caused by windstorms. Planetary Society members at the organization's founding. 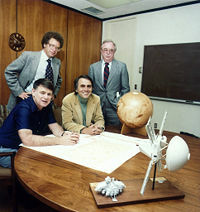 Carl Sagan is seated to the right. Sagan effectively urged the scientific community to listen with radio telescopes for signals from intelligent extraterrestrial lifeforms. By 1982, he was able to get a petition advocating the Search for Extra-Terrestrial Intelligence SETI published in the journal Science, signed by 70 scientists, including seven Nobel Prize winners. This even is seen as a turning point in the respectability of this controversial field. Sagan also helped Dr. Frank Drake write the Arecibo message, a radio message beamed into space from the Arecibo radio telescope on November 16, 1974, aimed at informing extraterrestrials about Earth. Sagan was chief technology officer of the professional planetary research journal Icarus for 12 years. He co-founded the Planetary Society, the largest space-interest group in the world, with over 1,000,000 members in more than 149 countries, and was a member of the SETI Institute board of trustees. Sagan served as chairman of the Division for Planetary Science of the American Astronomical Society, as president of the Planetology Section of the American Geophysical Union, and as chairman of the Astronomy Section of the American Association for the Advancement of Science. At the height of the Cold War, Sagan worked to increase public awareness efforts for the effects of nuclear war when a mathematical climate model suggested that a substantial nuclear exchange could upset the balance of life on Earth. He co-authored a scientific paper hypothesizing a global nuclear winter following nuclear war. He also co-wrote the book, A Path Where No Man Thought: Nuclear Winter and the End of the Arms Race. In January of 1991, during the First Gulf War, Sagan erroneously warned that smoke from the Kuwaiti oil fires might disrupt agriculture in much of South Asia. He later acknowledged the error in The Demon-Haunted World. In his later years Sagan advocated the creation of an organized search for near Earth objects (NEO) that could impact the Earth. Sagan had some interest in UFO reports from at least 1964. Though skeptical on the UFO question, Sagan thought scientists should study the phenomenon seriously. In 1966, Sagan was a member of the Ad Hoc Committee to Review the Project Blue Book, the U.S. Air Force's UFO investigation project. The committee concluded that the project had been lacking as a scientific study and recommended a university-based study to give the UFO phenomenon closer scientific scrutiny. The result was the Condon Committee (1966-1968), led by physicist Edward Condon, which formally concluded that there was no proof of the existence of extra-terrestrial based UFO's but that that there were gaps in scientific knowledge that might benefit from further research in the UFO field. In his 1980 Cosmos series, Sagan rejected the idea that UFOs are visiting Earth, maintaining that the chances any alien spacecraft would visit the Earth are vanishingly small. In one of his last written works, Sagan again argued there was no evidence that aliens have actually visited the Earth, either in the past or present. Sagan agreed with the theory that a large number of extraterrestrial civilizations had probably formed over the millennia, but that the lack of evidence of such civilizations implies that technological civilizations tend to destroy themselves rather quickly. This stimulated his interest in identifying and publicizing ways that humanity could destroy itself, with the hope of avoiding such a cataclysm and eventually becoming a successful spacefaring species. Following his marriage to his third wife (novelist Ann Druyan) in June 1981, Sagan became more politically active, particularly in opposition to the escalation of the nuclear arms race under President Ronald Reagan. Sagan spoke out against Reagan's proposed Strategic Defense Initiative ("Star Wars") project. He was also arrested in an anti-nuclear weapons protest at the Nevada Test Site on two occasions in the late 1980s. NASA Distinguished Public Service Medal was presented to Carl Sagan. He hosted, co-wrote, and co-produced the highly popular 13-part PBS television series Cosmos: A Personal Voyage modeled on Jacob Bronowski's The Ascent of Man. Cosmos covered a wide range of scientific subjects including the origin of life and a perspective of our place in the universe. The series was first broadcast by the Public Broadcasting Service in 1980, winning an Emmy and a Peabody Award. According to the NASA Office of Space Science, it has been broadcast since in more than 60 countries and seen by over 500 million people. His book, Cosmos, which reflected and expanded upon the themes of the television series, became the best-selling science book ever published in English. The Dragons of Eden: Speculations on the Evolution of Human Intelligence won a Pulitzer Prize. Sagan also wrote the best-selling science fiction novel Contact, but did not live to see the book's 1997 motion picture adaptation, which starred Jodie Foster and won the 1998 Hugo Award. The sequel to Cosmos, Pale Blue Dot: A Vision of the Human Future in Space, was selected as a notable book of 1995 by The New York Times. Sagan also wrote an introduction for the bestselling book by Stephen Hawking, A Brief History of Time. Sagan caused mixed reactions among other professional scientists. On the one hand, there was general support for his popularization of science and his positions in favor of scientific skepticism and against pseudoscience. On the other hand, he provoked unease that the public would understand some of his personal positions and interests as being part of the scientific consensus. Late in his life, Sagan's books developed his skeptical, naturalistic view of the world. In The Demon-Haunted World: Science as a Candle in the Dark, he presented tools for testing arguments and detecting fallacious or fraudulent ones, essentially advocating wide use of critical thinking and the scientific method. The compilation, Billions and Billions: Thoughts on Life and Death at the Brink of the Millennium, published in 1997, after Sagan's death, contains essays written by Sagan, such as his views on abortion, and his widow Ann Druyan's account of his death as a skeptic, agnostic, and freethinker. In 2006, Ann Druyan edited Sagan's 1985 Glasgow Gifford Lectures in Natural Theology into a new book, The Varieties of Scientific Experience: A Personal View of the Search for God, in which he elaborates on his views of divinity in the natural world. Sagan wrote frequently about religion and the relationship between religion and science, expressing his skepticism about many conventional conceptualizations of God. Sagan once stated, that "The idea that God is an oversized white male with a flowing beard, who sits in the sky and tallies the fall of every sparrow is ludicrous. But if by 'God,' one means the set of physical laws that govern the universe, then clearly there is such a God. This God is emotionally unsatisfying… it does not make much sense to pray to the law of gravity." One of his most famous quotations, though not entirely original, was "Extraordinary claims require extraordinary evidence." Sagan married three times: To biologist Lynn Margulis, mother of Dorion Sagan and Jeremy Sagan, in 1957; to artist Linda Salzman, mother of Nick Sagan, in 1968; and to author Ann Druyan, mother of Alexandra Rachel (Sasha) and Samuel Democritus (Sam), in 1981. His marriage to Druyan continued until his death in 1996. Sagan was a user of marijuana. Under the pseudonym "Mr. X," he wrote an essay concerning cannabis smoking in the 1971 book, Marihuana Reconsidered. After a long and difficult fight with myelodysplasia, which included three bone marrow transplants, Sagan died of pneumonia at the age of 62, at the Fred Hutchinson Cancer Research Center in Seattle, Washington, leaving behind his third wife and five children on December 20, 1996. Sagan's work in popularizing science, as well his many personal contributions to scientific theory and research, have been universally recognized, even by those scientists who did not agree with some of his activist stances. He was the recipient of dozens of prestigious awards from scientific, humanitarian, educational, literary, and humanist organizations, including the Oersted Medal (1990), the NASA Distinguished Public Service Medal (twice), the Pulitzer Prize for General Non-Fiction (1978), and the United States National Academy of Sciences Public Welfare Medal (1994), and the NASA Distinguished Public Service Medal. The landing site of the unmanned Mars Pathfinder spacecraft was renamed the Carl Sagan Memorial Station on July 5, 1997. Asteroid 2709 Sagan is also named in his honor. The 1997 movie, Contact, based on Sagan's novel of the same name and finished after his death, ends with the dedication "For Carl." On November 9, 2001, on what would have been Sagan’s sixty-seventh birthday, the NASA Ames Research Center dedicated the site for the Carl Sagan Center for the Study of Life in the Cosmos. Sagan has at least two awards named in his honor: The Carl Sagan Memorial Award presented jointly since 1997, by the American Astronautical Society (AAS) and the Planetary Society; and the Carl Sagan Award for Public Understanding of Science presented by Council of Scientific Society Presidents (CSSP). Sagan himself was the first recipient of the CSSP award in 1993. Sagan's student Steve Squyres led the team that landed the Spirit Rover and Opportunity Rover successfully on Mars in 2004. Sagan's son, Nick Sagan, wrote several episodes in the Star Trek franchise. Isaac Asimov described Sagan as one of only two people he ever met who was smarter than Asimov himself. ↑ Sagan (1996), 81-96, 99-104. ↑ Marcello Truzzi, "On Some Unfair Practices towards Claims of the Paranormal," Oxymoron: Annual Thematic Anthology of the Arts and Sciences Vol.2: The Fringe (Oxymoron Media, Inc., 1998). Davidson, Keay. Carl Sagan: A Life. New York: John Wiley & Sons, 1999. ISBN 0471252867. Head, Tom (ed.). Conversations with Carl Sagan. Jackson, MI: University of Mississippi Press, 2005. ISBN 1578067367. Poundstone, William. Carl Sagan: A Life in the Cosmos. New York: Henry Holt & Company, 1999. ISBN 0805057668. Sagan, Carl and Ann Druyan. The Demon-Haunted World: Science as a Candle in the Dark. Ballantine Books, March 1996. ISBN 0345409469. This page was last modified on 12 January 2017, at 21:19.